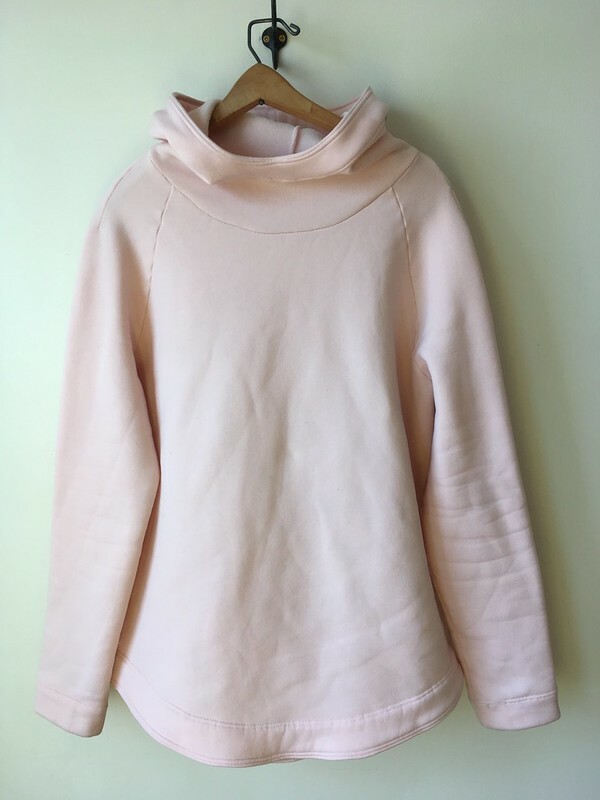 This sweatshirt is the ultimate in coziness, and a big part of that is fabric choice. The pattern and fabric were birthday presents from my kids, and I’m so happy that they got them for me. I fell in love with this pattern when I saw Devon Iott’s version (@missmake on Instagram), and after sleuthing around the internet looking at different iterations, I put it on my wishlist. Did you know you can buy printed versions of some of Style Arc’s patterns on Amazon? They come printed on nice, sturdy paper. 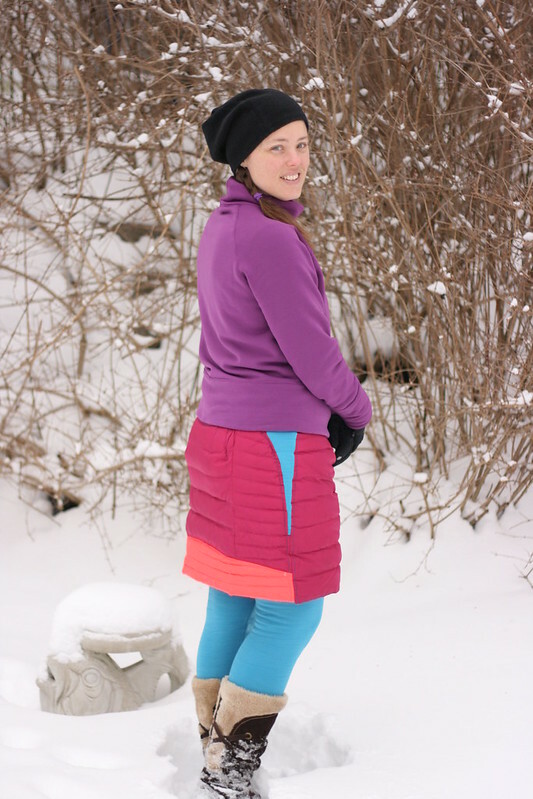 The fabric is Polartec Power Stretch from Mill Yardage. 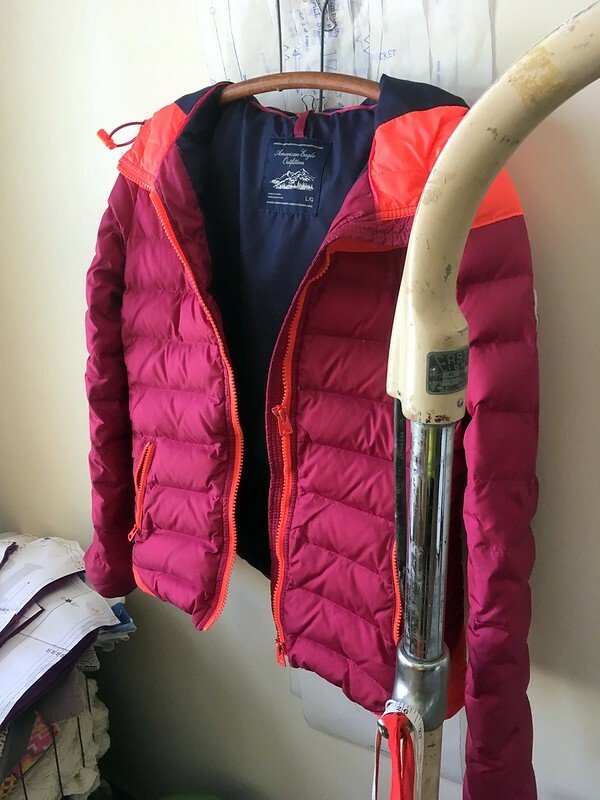 For the last few years I have gotten Polartec/Malden Mills brand fleece either at Field’s Fabrics in Kalamazoo, MI or millyardage.com. 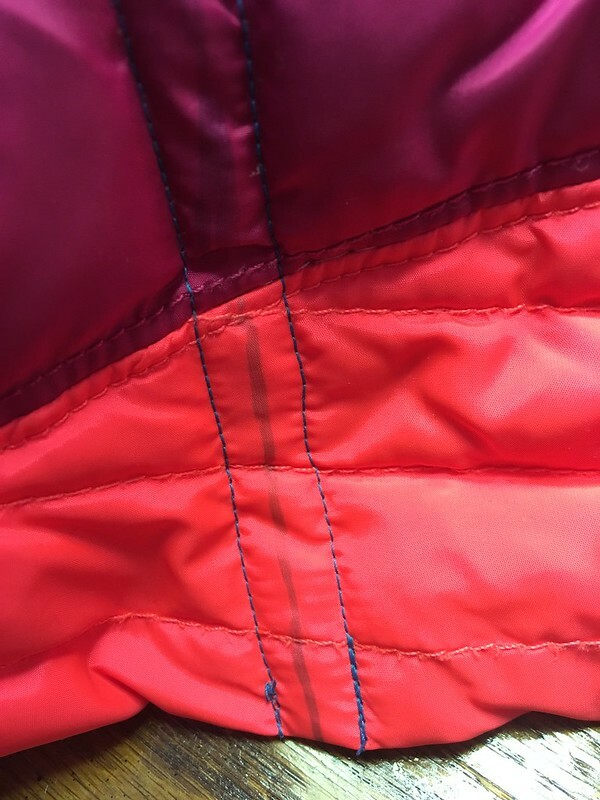 When I order from Mill Yardage, I often look at the seconds because, although Polartec has marked them as lower quality, whatever defect they have isn’t obvious, which means great fabric at a lower price. After trying Power Stretch one year, I fell in love with it for its soft, stretchy fluffiness, which makes it so comfortable. 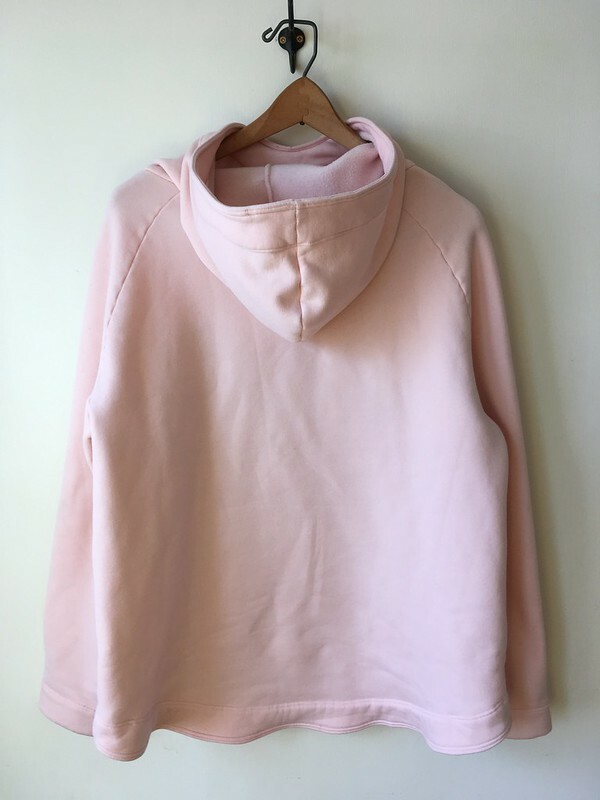 I thought this color and type of fabric would make a great Josie Hoody. The only downside is that it can get dirty a little more quickly than a darker color, especially around the cuffs. So far, any dirt has come out in the wash, though. 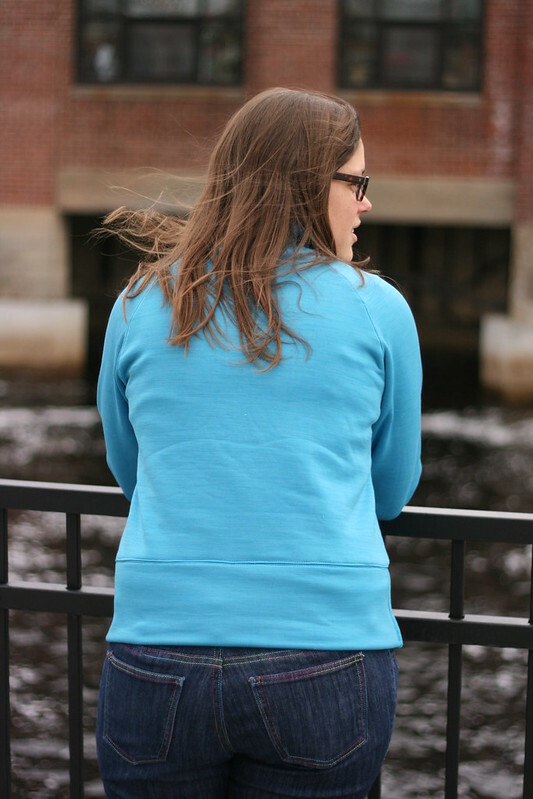 Although I tend to prefer zip-up sweatshirts to over-the-head sweatshirts, this quickly became a favorite. I love the light color, the feel and squishiness of the fabric, and the style of the pattern. I did take a little off the top of the hood so that it would fit better, but in a drapier fabric, I might leave it so that the hood stays nice and deep. I graded from a 12 at the bust to a 16 at the hip, and from a 12 at the armscye to a 16 sleeve as soon as I was able. 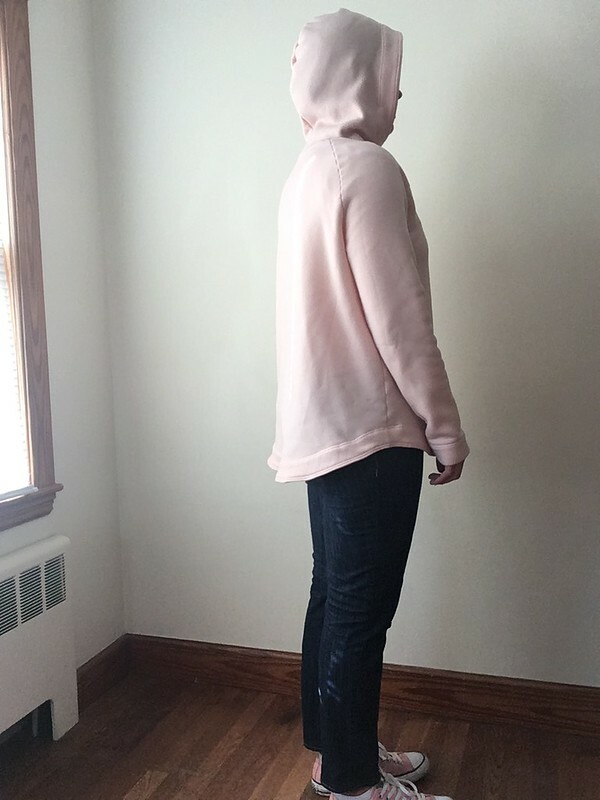 I used the size 12 hood. I omitted the drawstring, and didn’t use interfacing. Note: some of my double needle stitches have come undone. I’m not sure if this is because I used older thread or for some other reason. I use older thread that’s been given to me all the time and haven’t had any problems so far, so it’s hard to tell if this is the issue. 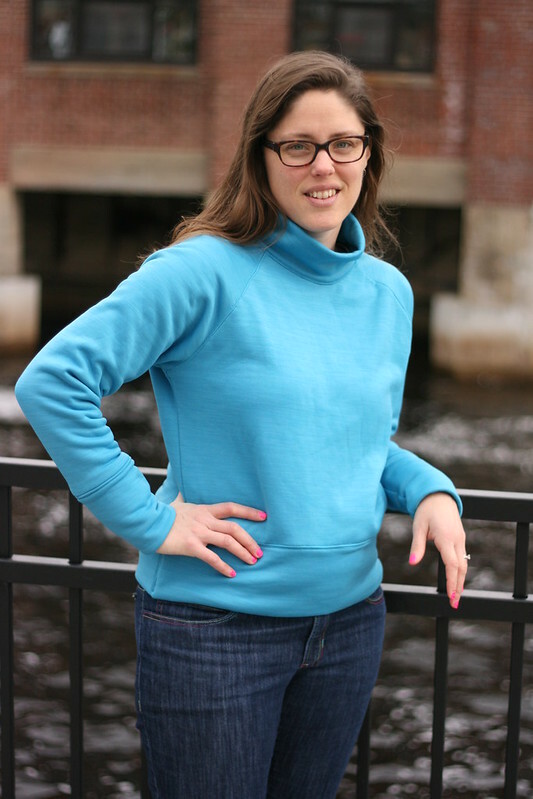 This is a great sweatshirt that is quick to make and great to wear. I definitely recommend it! 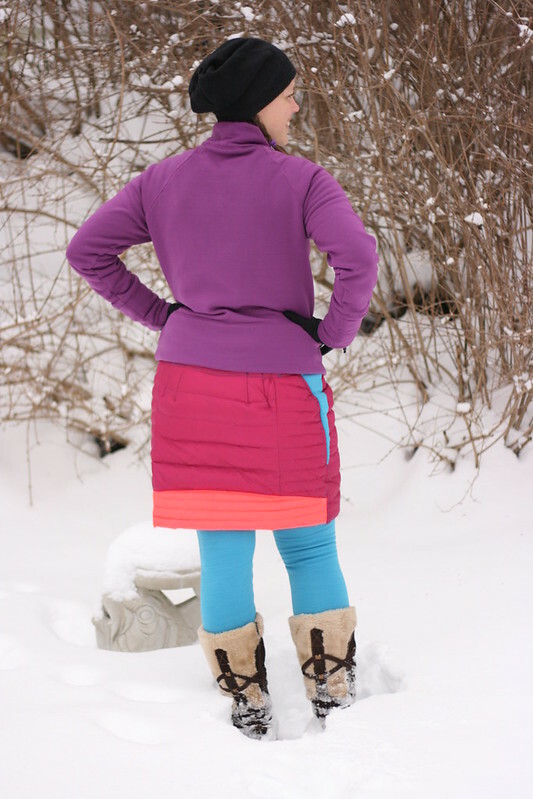 Refashion: Down Jacket Into Down Skirt…or…Struggle. Victory. It was a grey and stormy day when I finally cut into a project I had long been contemplating. It was a refashion, but not just any refashion. 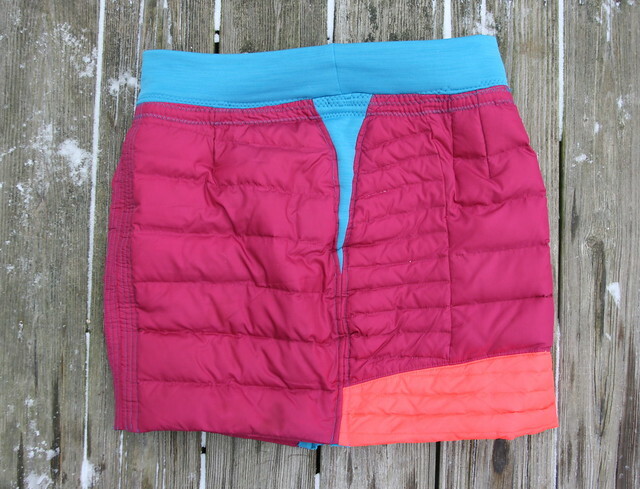 This one involved sewing with a material I had never tried before: a down jacket. 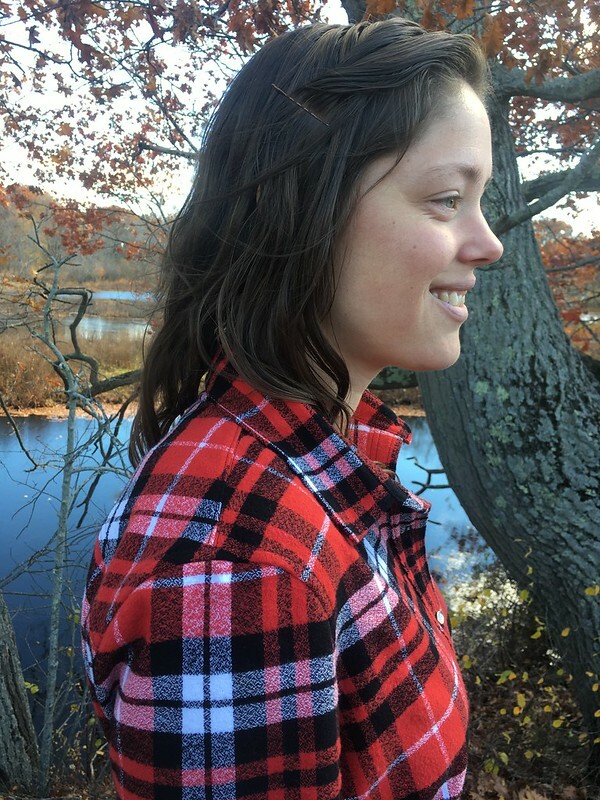 I had chosen the patterns that were going to help me achieve my goal and planned a little more than half of the project, but there were still questions in my mind about how I was going to finish the rest. Inspiration images had been pinned to my Pinterest board, but still I mulled it over…until the snow day. It was finally time. 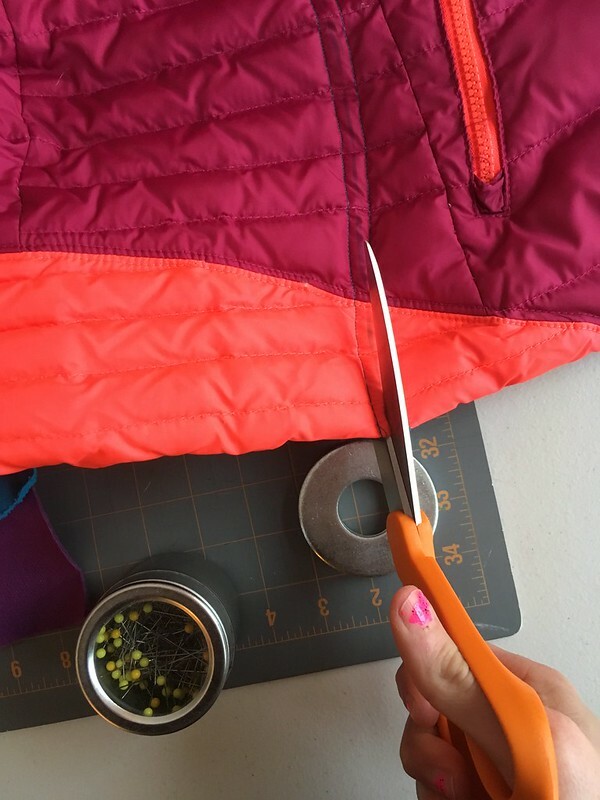 I had already been scheming about refashioning a down jacket into a scarf after seeing these ones, which was the product of a collaboration between Patagonia and Alabama Chanin, but my down-sewing plans expanded when we visited Colorado last winter and I saw a woman wearing a down skirt. It was such a brilliant idea. Google revealed that down skirts are actually a thing, even though the Colorado one was the only one I had seen in real life. 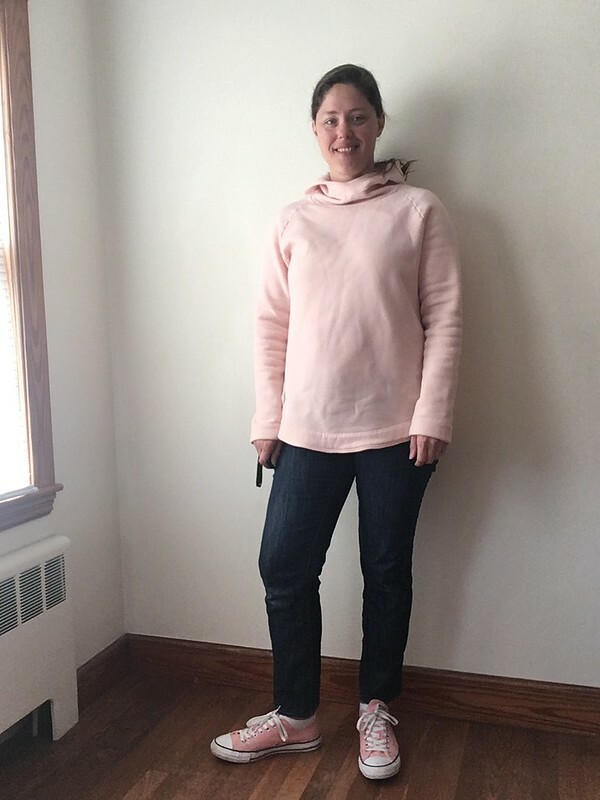 So, after a ton of thought, I chose New Look 6843 for the skirt portion, and the waistband from the leggings in McCall’s 7261 for my stretchy waistband. Since I wanted this to be a pull-on skirt, a waistband and some gores/gussets/godets in the side of the skirt were in order (after seeing the skirt, you can tell me which term is the right one for what I did 😉 ). I managed to turn the back skirt into a single piece and eliminate the zipper. All of that fit onto the back of the coat, allowing me to use the bottom of the coat as my hem. It got tricky when I came to the front because that was supposed to be one piece, too. 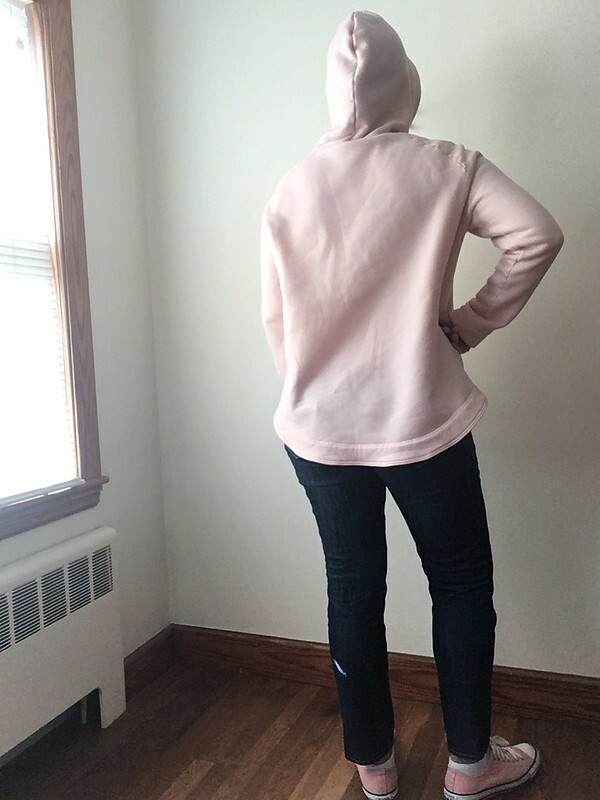 I really wanted to incorporate the coat zipper in a decorative way (although I planned to sew it shut), and I also wanted the pockets both for decorative and functional purposes, but in the end, it was too much of a struggle. I realized that by opening my sleeves and sewing them together, I would have enough for my front piece. 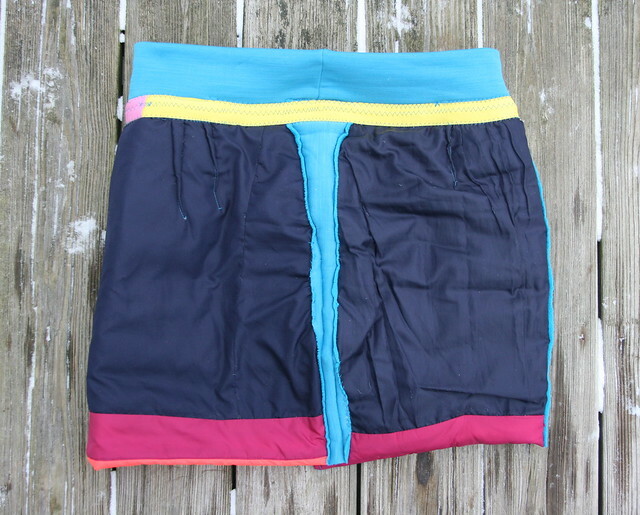 I still had plenty of the stretchy fleece left from my Toaster Sweaters for my waistband and gores/gussets/godets. Then it was all construction. This is probably the point when you are asking how in the world I cut and sewed that crazy stuff. That is a very important question. 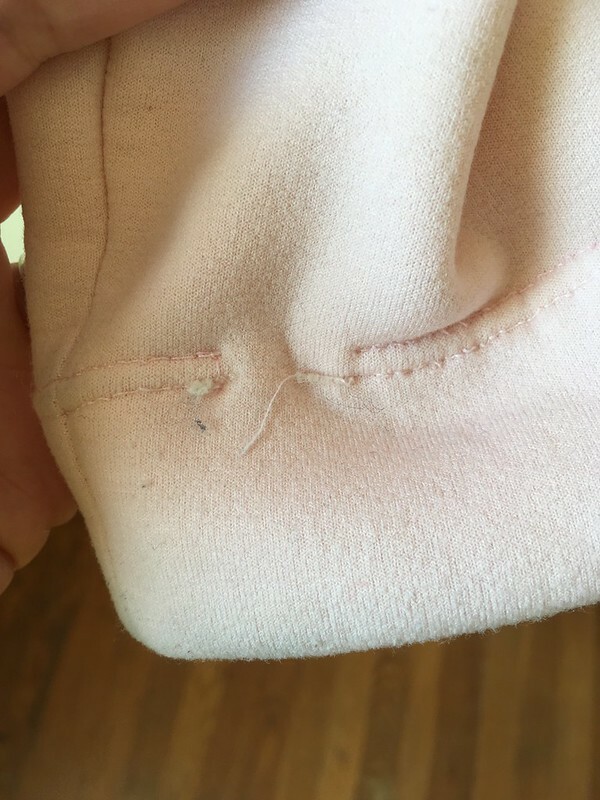 Here is what I did: I marked my cutting lines with a water-soluble pen and sewed with a straight stitch on either side of my cut line in the hopes that it would hold all the down in. Well, it sort of did. Not ALL of the down came out. But some did. Here’s how I had to sew. I also realized that I needed to cover every seam on the inside if I didn’t want to perpetually shed feathers. This was the point where things got a little…”Becky-home-ecky” (sorry if your name is Becky). The finishing, while functional and necessary, didn’t meet the vision I had in my head, but I was sort of racing against the down and my nausea. The good news is, when I’m wearing it, I think it looks like something I could have bought at an outdoor store. (If you disagree, you don’t have to tell me.) It’s only if you get up close or look inside that you see the craziness, and since people don’t do that when I’m wearing it (thank goodness! ), I think I’m safe. Want to see it? Check it out! This skirt has the added benefit of a little puffy booty enhancement up top. It’s too high for people to think you pooped in your pants, so I like to think of it as booty enhancement. 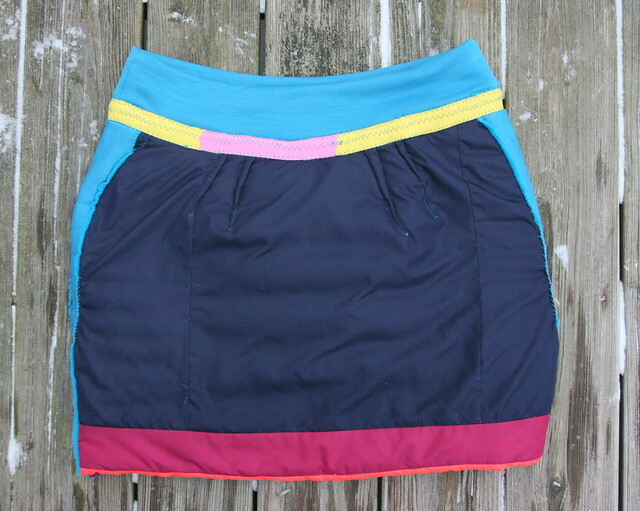 Maybe it’s because I sewed all the darts in the skirt, even though I basically negated them with those side triangles. 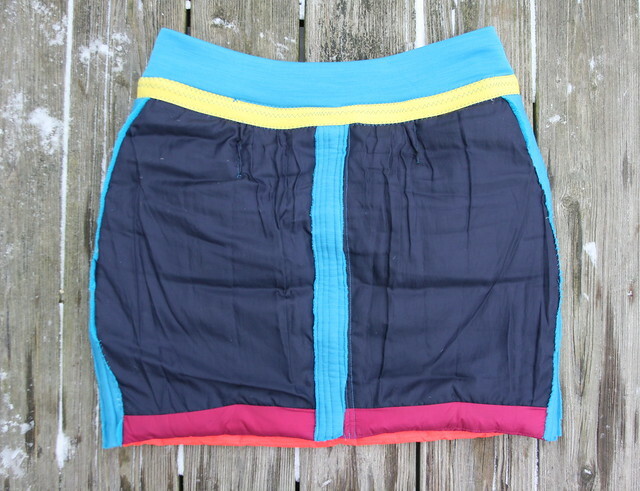 I needed the triangles, though because if you’re going to eliminate the zipper, you need some way to get your skirt on! Side view (above). I folded the front of the skirt down at the top a bit because it was originally higher in the front and lower in the back, but that feels weird to me. I want it the other way around. Inside front (above). 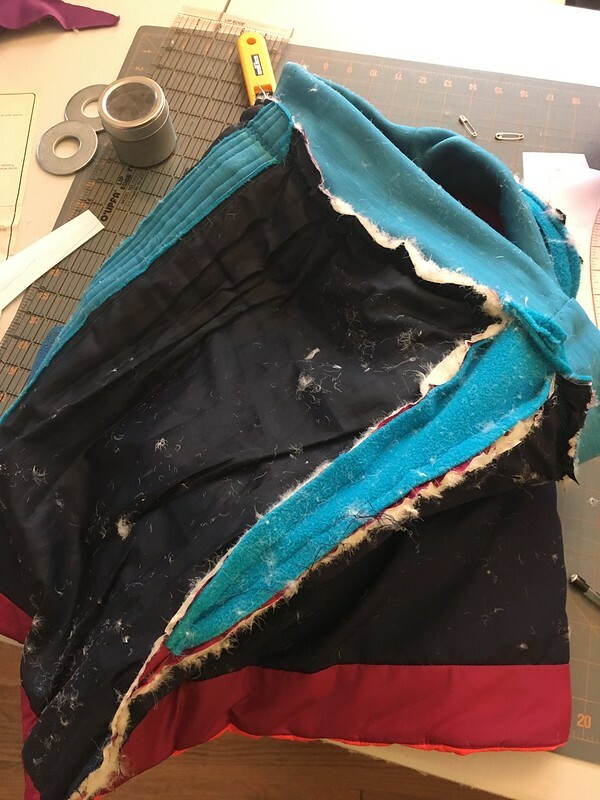 I covered my seams with fleece, but didn’t sew with a wide enough seam allowance, so I ended up sewing extra lines and hand-tacking things just to get all those feathery seams covered. 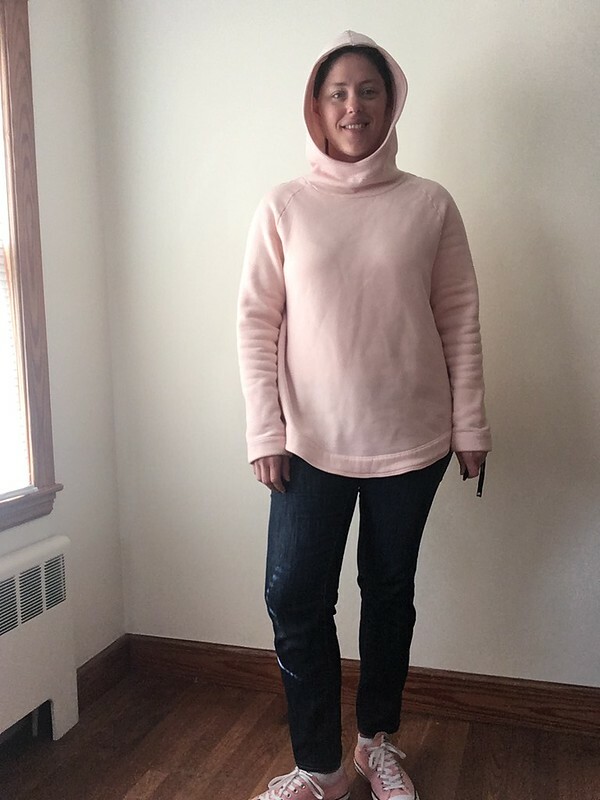 I also covered my top seams with wide fold-over-elastic (although I didn’t fold it), and used a zig-zag stitch to hold it down and allow for a little stretch at the waist. That doesn’t look great, either, but again, you don’t really notice it that much when I’m wearing it, so whatever! Inside side view (above). Here’s where it started to get ugly, but I just wanted to finish at this point. 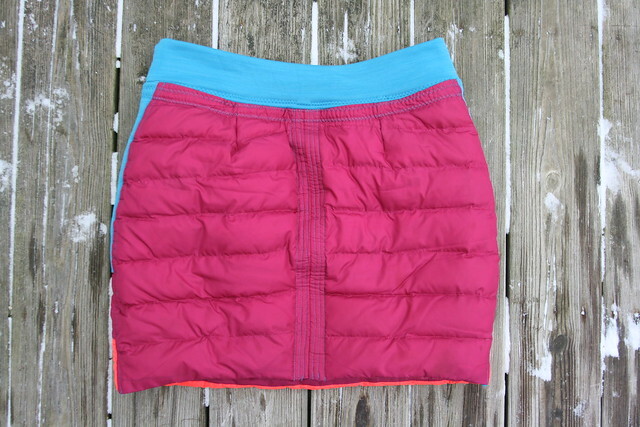 It was helpful to have the coat lining as a lining for my skirt because I could hand tack the fleece to it. 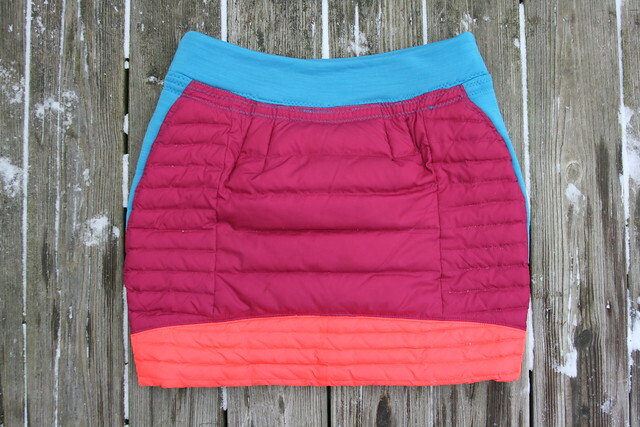 Despite any deficiencies in the finishing, I LOVE THIS SKIRT!!!! When I wear it, I feel ready to take on winter! 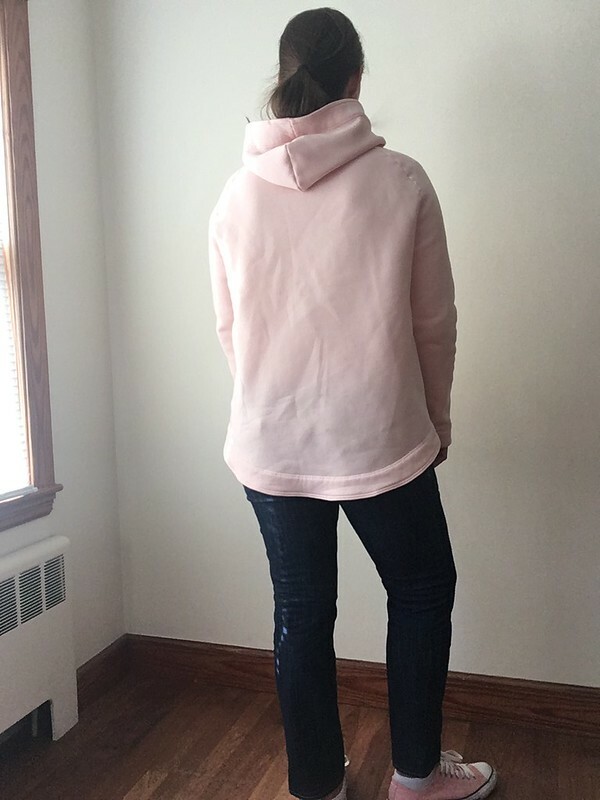 The fit is great and it is so cozy that I wore it for two days straight after making it (and vacuuming my work room a.k.a. our living room…twice). 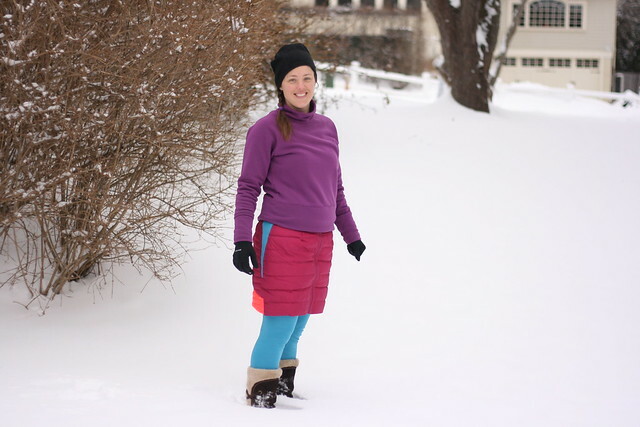 In January I made these fleece leggings and the Toaster Sweater that I’m wearing in this picture, and this outfit is pretty much winter perfection. I love it so much. After I finished, I contemplated making a scarf from the remnant of the jackets, but I decided to just put it away for now. I DID NOT like sewing with all that down. However…my husband had the brilliant idea to make a scarf from it in the summer…while sewing outside. He’s so smart! On Wednesday I made the Blueberry Poppyseed Snacking Cake from the Seven Spoons cookbook, and now I just want to eat that all the time. I know this would be unwise, so I gave the last piece away before I could eat it. I have some old gaiters from L.L. Bean that I just love. They don’t sell the exact style I have anymore, so this is the closest I could find, but they are great if it’s snowy out and I don’t feel like putting snow pants on. 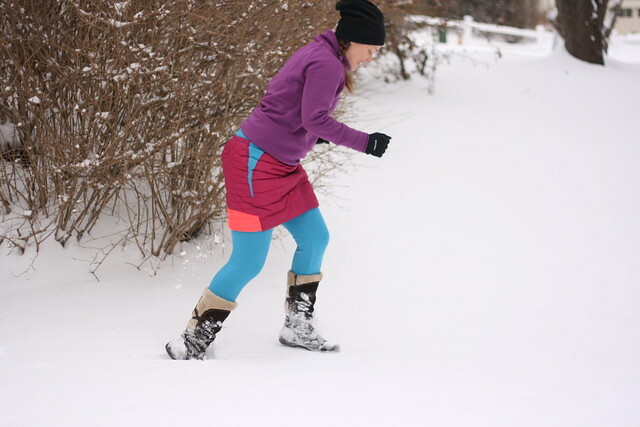 I can walk through several inches of snow without it getting in my shoes or on my pants. I used them for a walk on Thursday, and it just reminded me of how much I love them. Is orange the new black? Are doughnuts the new croissants? Do you like to say that _____ is the new ______ ? Then check out this fun and funny website, where each time you click, you get a new ‘this is the new that’. This creation is brought to you by my getting caught up in the wave of cozy versions of this sweater floating around the sewing internet. I often get caught up in these things, but rarely give in. 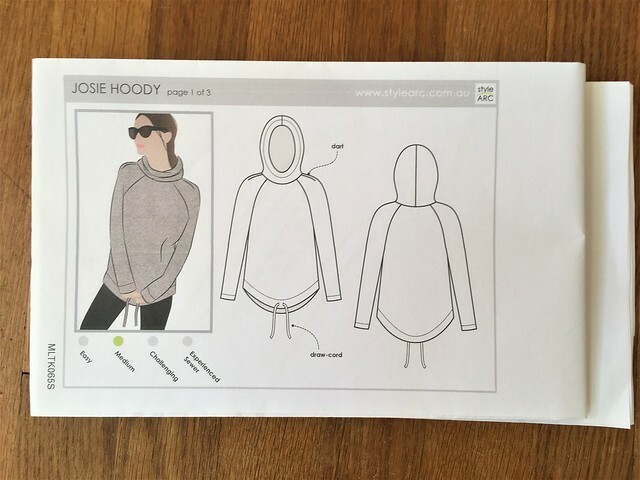 This time, I not only got caught up, I bought the PDF version of this pattern, something I almost never do! I’m not a big fan of PDF’s from a user end. 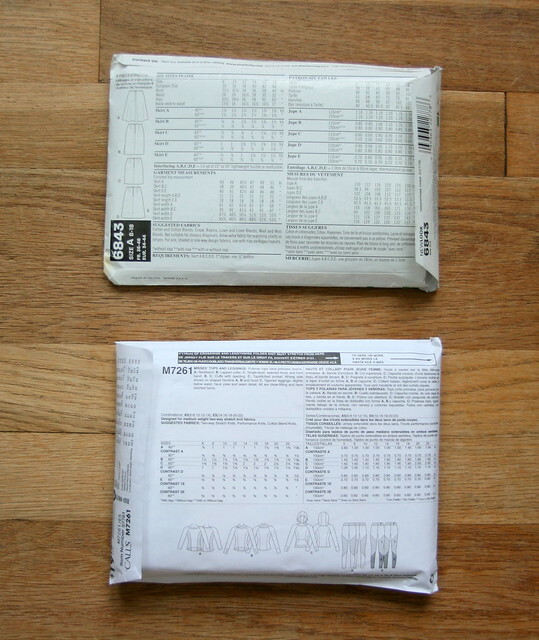 They are a great way for a new company to get their patterns out into the world for a lower start-up cost, but from a sewing perspective, I’d always rather have a paper pattern. Sometimes I will even pass on a pattern I like if it doesn’t come in a paper version. This time, though, I realized that I could buy the PDF of the single view that I wanted (the pattern comes with two views) for less than the price of the paper or full PDF pattern, and I could have it NOW. 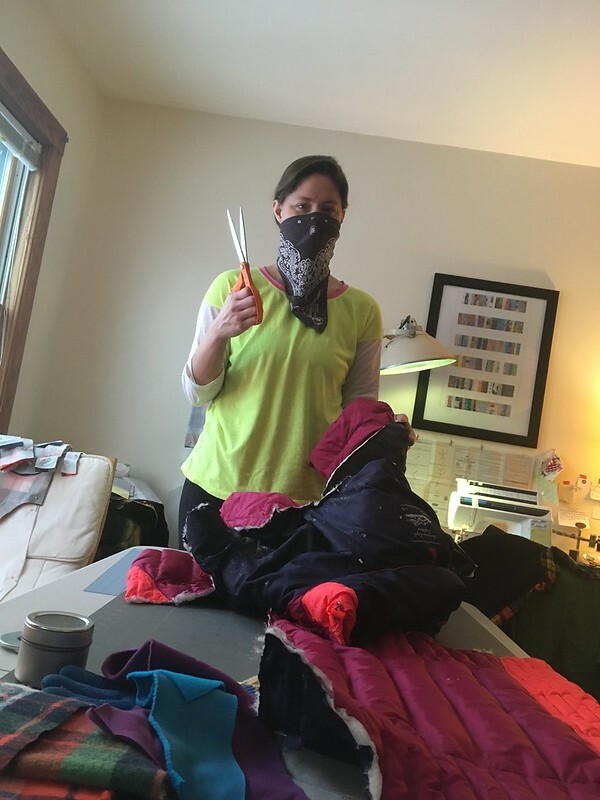 I already had my fabric, some Polartec Power Stretch (at least I think it’s Power Stretch) that I bought this past summer at one of my favorite fabric stores in Michigan, Field’s Fabrics. It was just waiting for the right pattern. And this was it. 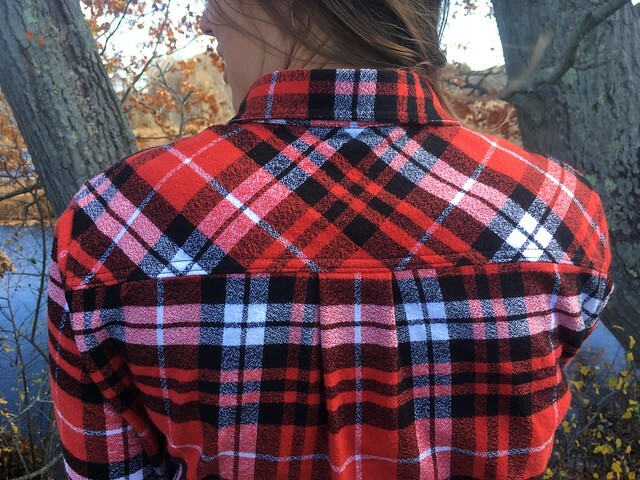 This is a great pattern and a fast sew. There aren’t too many pieces, and the instructions are great, which makes the construction feel really simple in a good way. 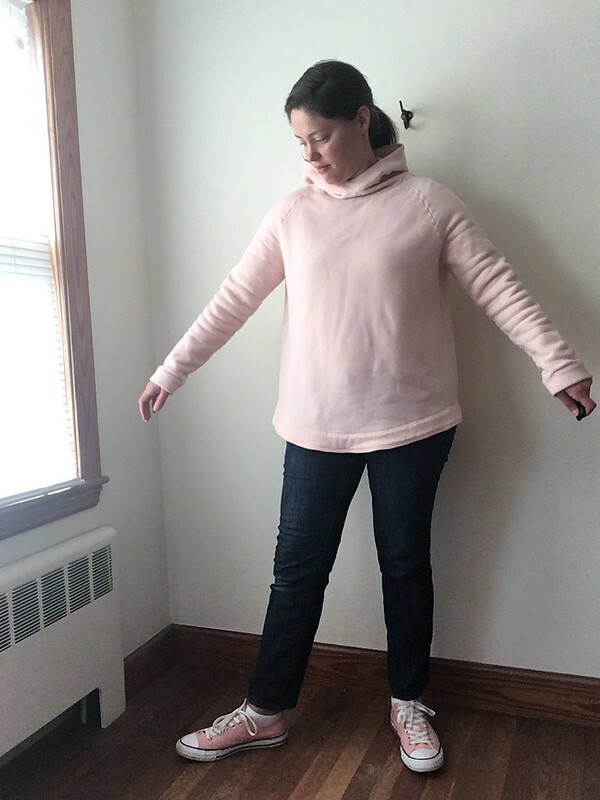 I made this before making the Coppelia Cardi from Papercut Patterns, and I’m glad I did. The helpful advice about double stitching is something I’ve been using in all my recent knit projects. I had all these plans to alter the pattern before getting started. I wanted to lengthen it and grade the hips out to a larger size, etc., etc., but in the end I made a straight size large for the first version. I had two colors of fleece, so I figured the first could be a wearable muslin, and I could change things up for the second if I wanted to. In the end, all I changed for number two was to add another inch in width to the bottom band so that, hopefully, the sweater/sweatshirt would hang down over my hips, rather than sort of sitting on top of them. I’m not sure that this made a huge difference, but the good news is that both versions are really great. 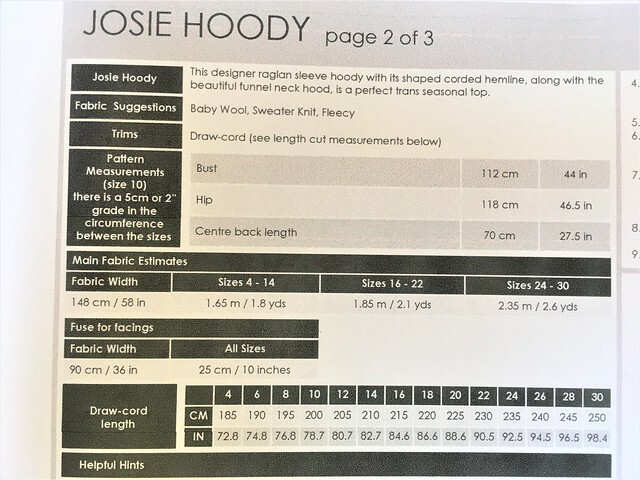 Here are some knit sewing construction details for anyone who is interested. 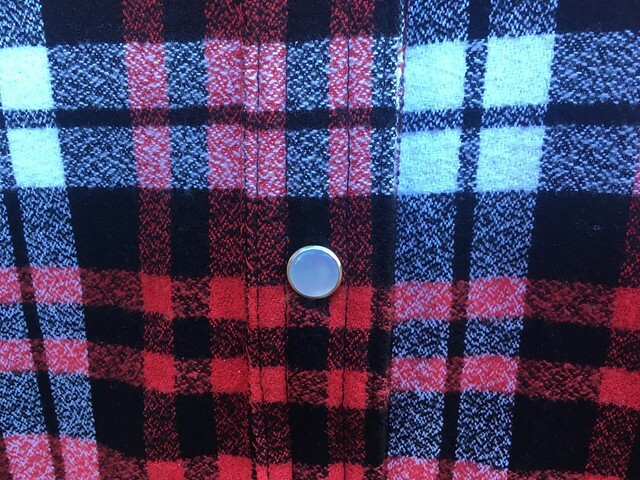 I used a 90/14 stretch needle (Schmetz brand) and a walking foot with Gutermann polyester thread in the top and wooly/bulky nylon in my bobbin. Normally I just use wooly nylon for swimwear, but I wanted to see if I could get a better stretch stitch, and this turned out to be just the thing. I used a straight stitch with a length of three for my first pass and a three-step zigzag stitch next to that in the seam allowance for my second pass on each set of pattern pieces. For the zigzag, I used a width of 6 and a length of 1. My tension was at 4 and my presser foot tension was at 3. I did not use a serger. 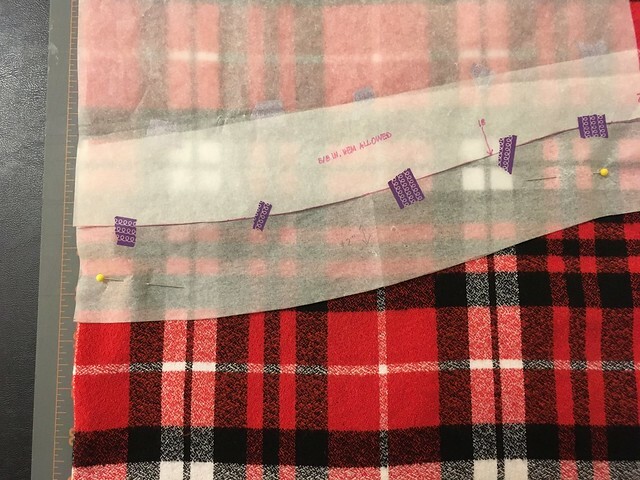 To figure out my stitch length and width, I used the suggestions that came printed on my machine and tested them on fabric scraps. Then I stretched each test to see if any of my stitches popped. The straight stitches will pop if you put enough stress on them, but I think it is worth doing both because the straight stitches give you a clean join in your pieces while the zigzag provides extra strength and stretch. 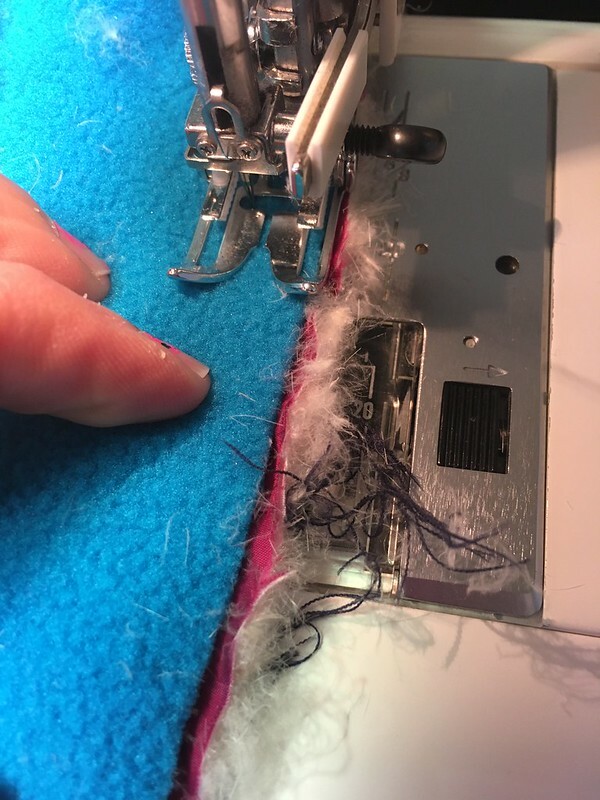 I used a universal twin needle since I didn’t have a stretch twin needle at the time (I’ve since gotten one, and it’s great, but the universal did work as well). 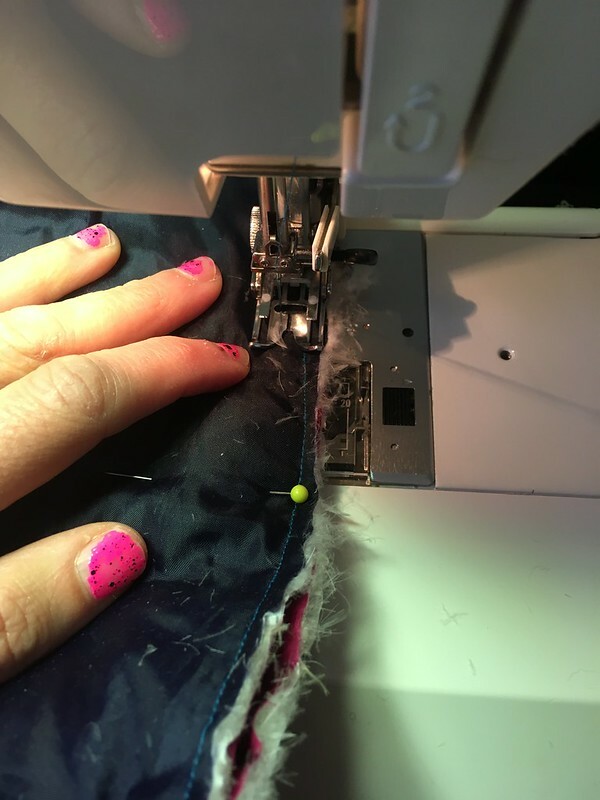 I didn’t press my seams since I was sewing Polartec and I didn’t want to melt it, but I used the twin needle even in spots like the vertical neck, cuff, and bottom band seams to hold my seam allowances to one side. I think I finally have the hang of the double needle now, and I’m so happy about it. So, in conclusion, I really like this pattern. I don’t think these are the world’s most flattering tops on me personally, but I don’t really care. I love them and I wear them a ton. They are so cozy in fleece and just perfect for winter. 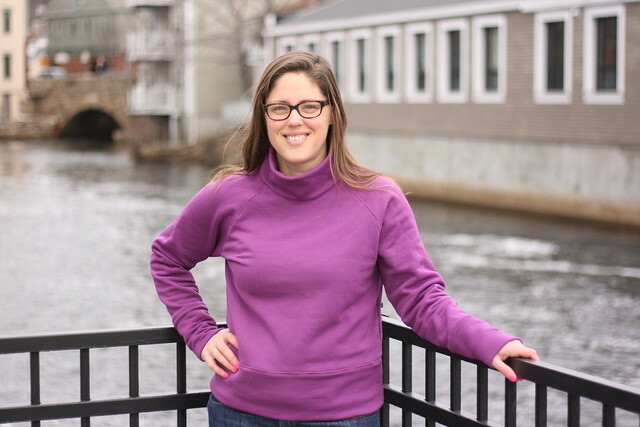 I’ve said it before, but it’s worth saying again: fleece from Malden Mills (Polartec brand fleece) is awesome for cold weather. 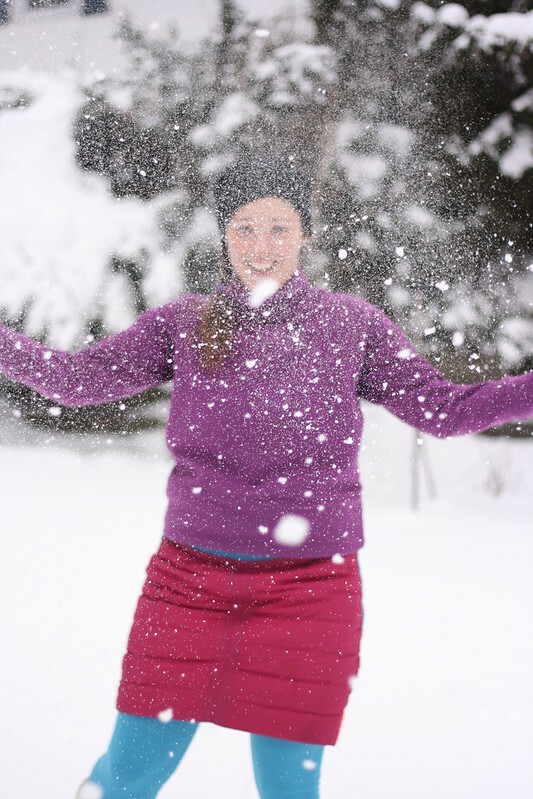 I love natural fibers year-round, but Polartec fleece is cozy and technically fascinating. Reading their website really gives you an appreciation for all the innovation in these fabrics. I found this article really helpful: How a Sewing Machine Works, Explained in a GIF. I could never picture the inner workings of my machine before. Thanks to Maggie from Pintuck & Purl for this one. It will come as no surprise when I tell you that I’m really excited about my latest creation. For so many sewers, the last thing they’ve made is their favorite and this is pretty much along those lines. It is hard for me to top last week’s pants, so maybe this isn’t my absolute favorite, but it’s a pretty close second. 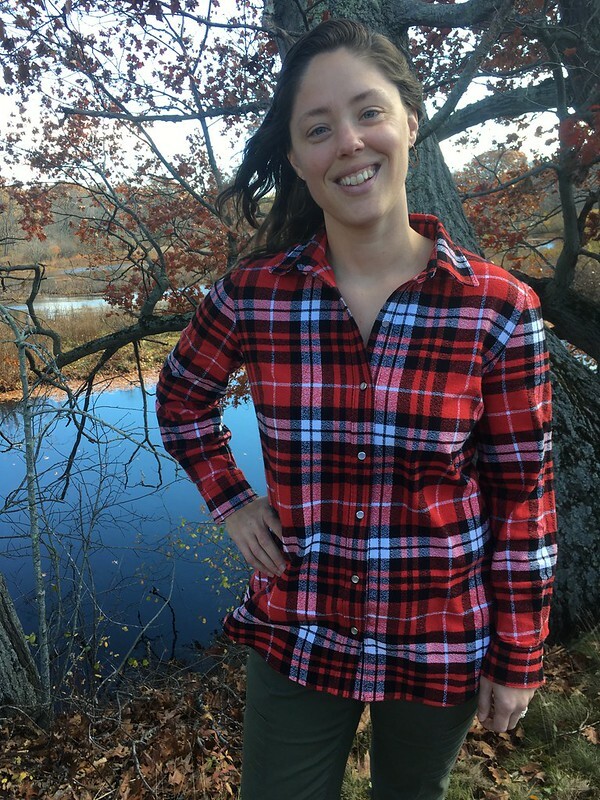 I present to you my new favorite fall flannel shirt: Simplicity 1538 made in Scarlet Robert Kaufman Mammoth Flannel. I am IN LOVE with this shirt (at least as much as you can be with clothing). Like the time I made my husband Thread Theory’s Jutland pants, I feel that the value of this shirt far exceeds what I paid for the fabric. 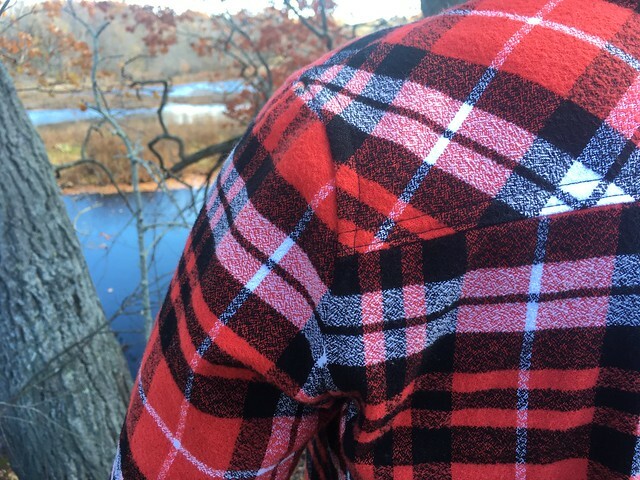 What I think really clinches it for me, though, is the feel of this flannel. When I felt it initially, I was actually somewhat disappointed. It seemed much thinner than I remembered this line of fabric feeling. Still, I had wanted to sew with it, so I bought my yardage, took it home, and washed and dried it. Once it had been washed and dried, it fluffed up into a beefy, cozy, heavenly bit of fabric. I loved sewing with it, and I love wearing it even more. 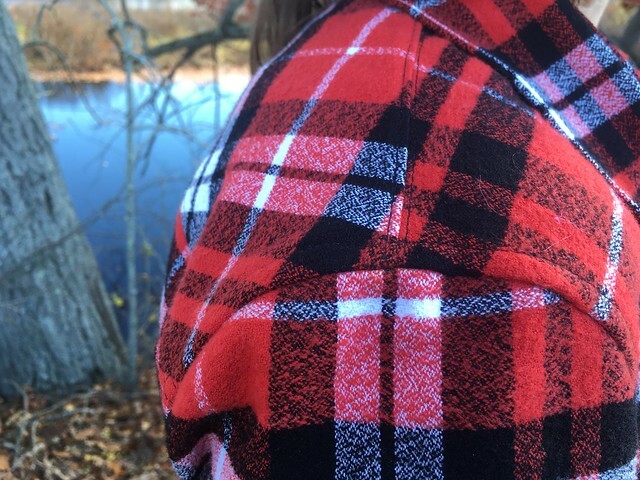 This shirt also marked my first real foray into plaid matching. 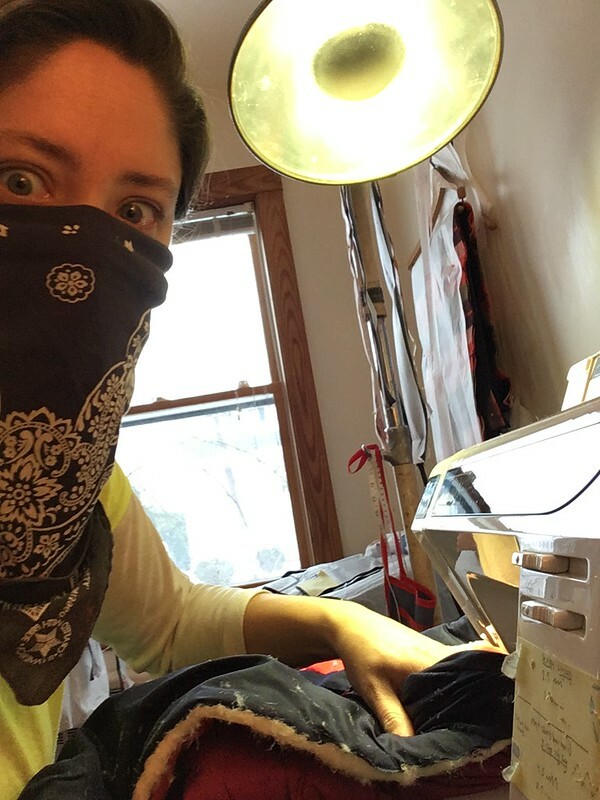 I had sort of done a bit of it when I made a shirt in Cotton + Steel’s Paper Bandana print, but this time I got serious. I looked around at advice on the internet and in some of my trusty sewing books and tried to pick some reference points I could use to match things up. 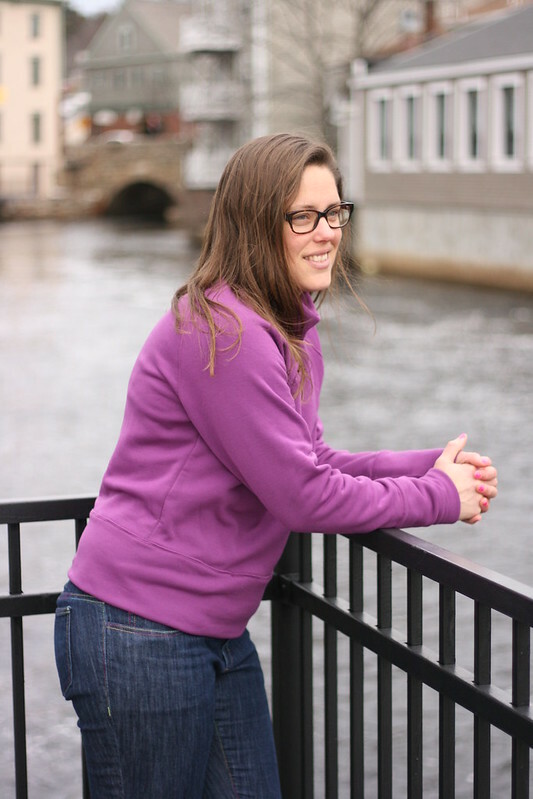 My goal was to try to do a good job without letting myself slide down the slippery slope of perfectionism. And I think I achieved my goal. Not perfect, but really, really good. And, (dare I say it?) it was kind of fun! 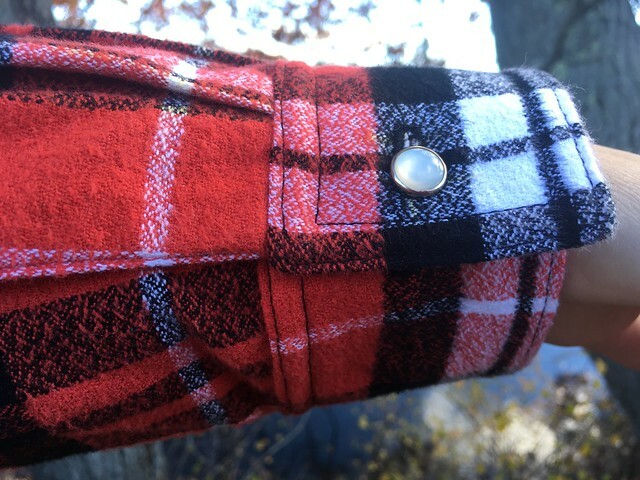 I see now, from experience, why you really want to have some extra yardage when you are matching plaids. I really like setting my cuffs, yoke, and button bands on the bias, but there just wasn’t enough extra fabric to do that anywhere except the yoke; however this gave me the chance to work on some pattern matching across the front. 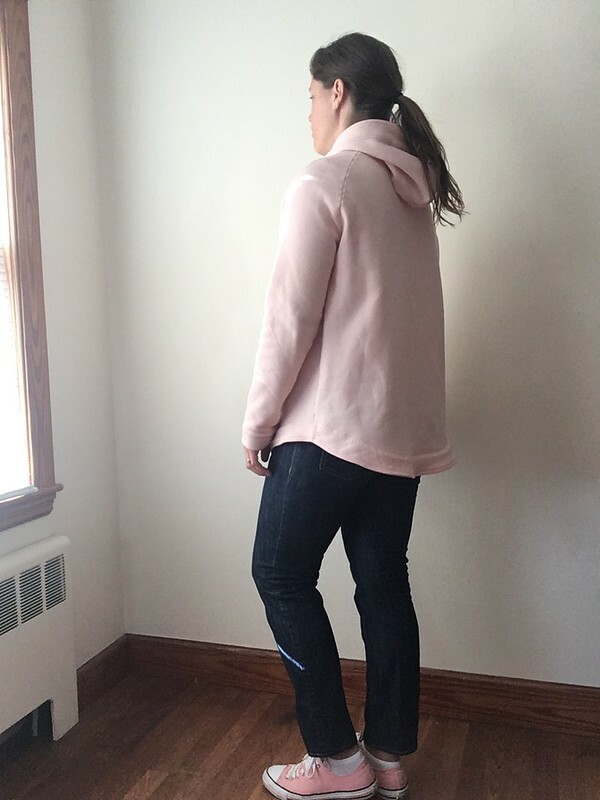 The adjustments on this pattern are as follows: major broad back adjustment and lowered darts (as discussed here) and for this version, I also added two inches to the length. I knew I wanted to add 2-4 inches so the shirt tail would cover my backside for wearing with leggings and 2 inches was a good amount. It doesn’t cover completely, but it almost does. I’m happy with it. 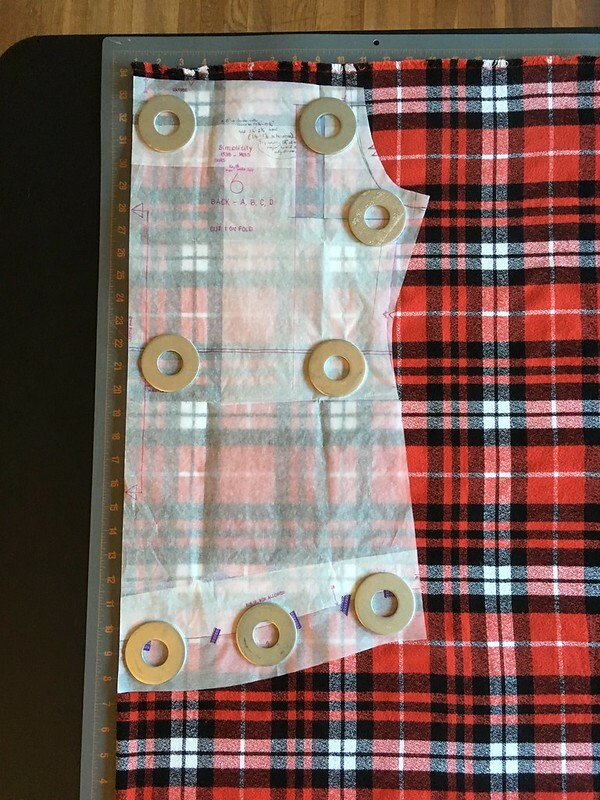 Additional Note: I completely forgot to add this when I first published this post until Monique brought it up in the comments–all my seams that aren’t automatically finished/covered (like in the collar) are flat-felled. 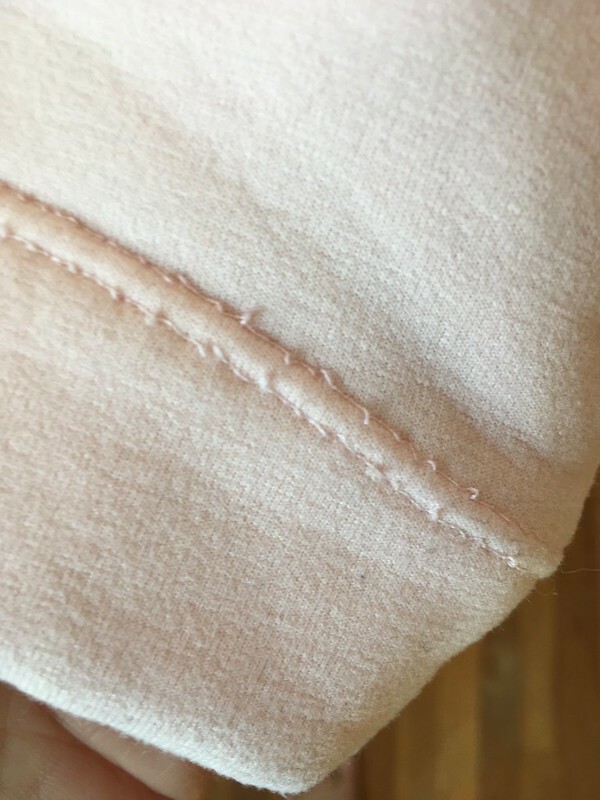 I wasn’t sure I could manage to get the sleeve seams done on my machine, but after reading a few posts on other blogs, I became convinced I could do it. In order to make it work, I put my sleeves in flat. 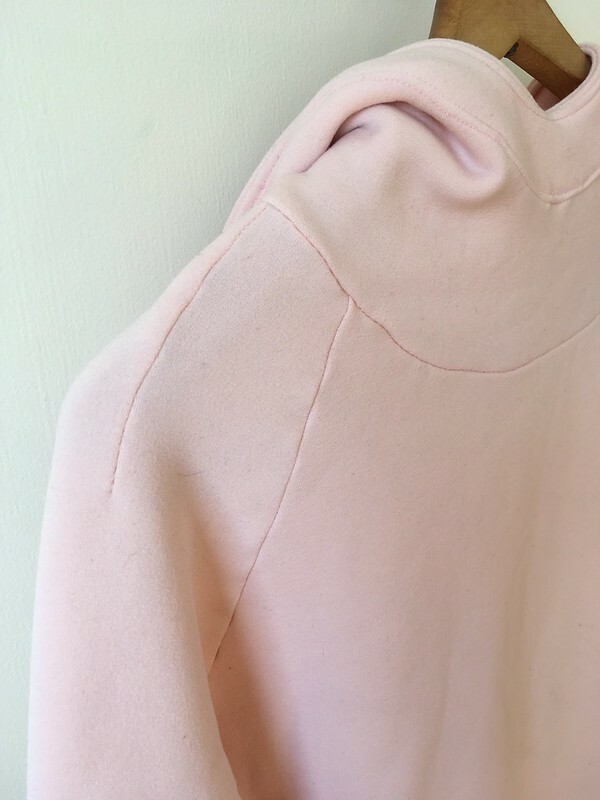 Rather than sewing up the side seams and then setting the sleeve as my instructions directed, I sewed the sleeve on with my flat-felled seams first and then sewed up the sides and sleeves in one fell swoop, flat-felling those seams as well for a nice clean finish inside. It’s a bit tricky to do, but if you go slowly and have patience, it’s completely possible, and the end result is strong and beautiful. And that’s it. If you know me in real life and notice me wearing this shirt and last week’s pants every time we see each other for the next month, don’t be surprised. 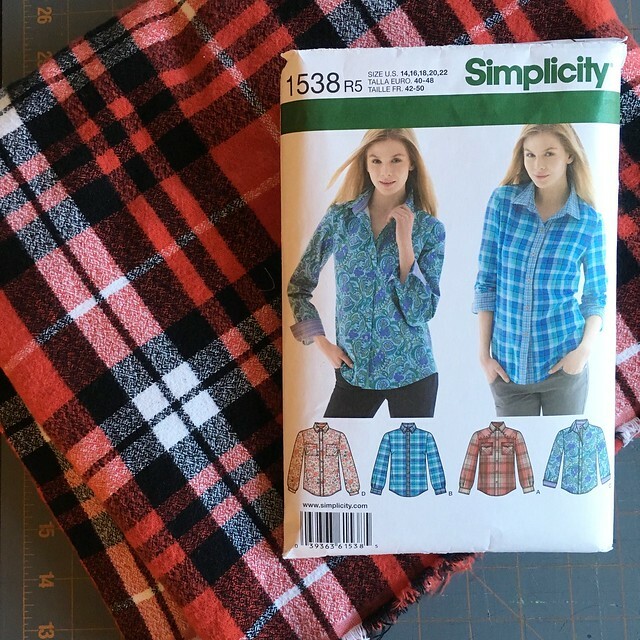 I think I’ve finally found my tried ‘n true button up shirt pattern and a much loved fabric company. I highly recommend both. First on my list is a long-time favorite of mine: Harney & Sons Bangkok Green Tea. It has a subtle coconut flavor that I really like. Polartec fleece from Malden Mills. 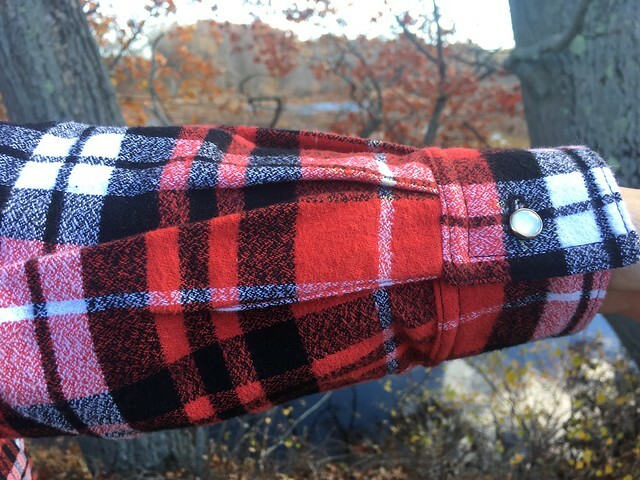 When the temperatures dip, this fabric can’t be beat. It’s great for outdoorsmen and it’s great for the everyday. It also has some pretty amazing science behind it. Along the lines of the last recommendation, if you live in West Michigan or plan to visit, Field’s Fabrics is a great place to find Polartec in various forms along with all sorts of other great fabrics. I love going to Field’s and always try to visit if we are in Michigan. You guys know I like to watch surfing, especially in the winter since it reminds me that it won’t be freezing and snowy forever and, as we head into the cold season in this part of the world, I’m keeping an eye open for good surf videos. I can’t vouch for the whole movie (since I haven’t seen it), but the trailer of View from a Blue Moon about surfer John John Florence, is stunningly beautiful.